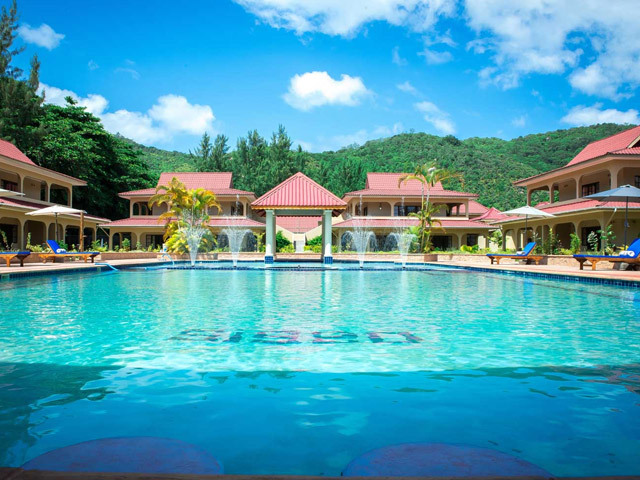 The Oasis Hotel, Restaurant and Spa at Grande Anse on the exotic island of Praslin is nestled amidst vibrant tropical greenery. Distinctively designed to provide a stress free atmosphere, guests can leave behind the stresses of modern life and revitalize themselves in a laid back environment. 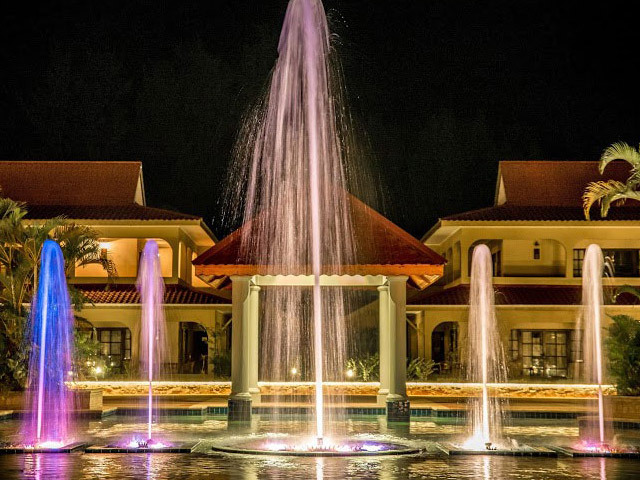 A spectacular water fountain in our classic rectangular swimming pool is the heart of the Oasis Hotel, Restaurant and Spa. 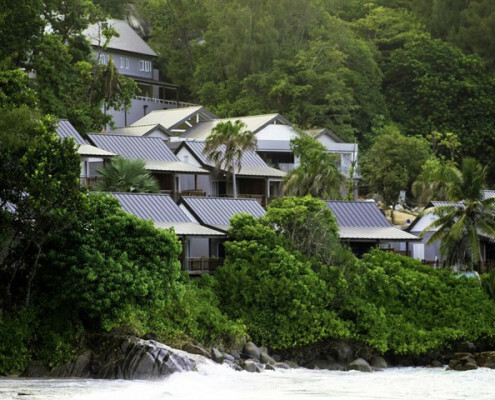 This tranquil oasis is the focal point where guests can mingle, relax and recharge the batteries. 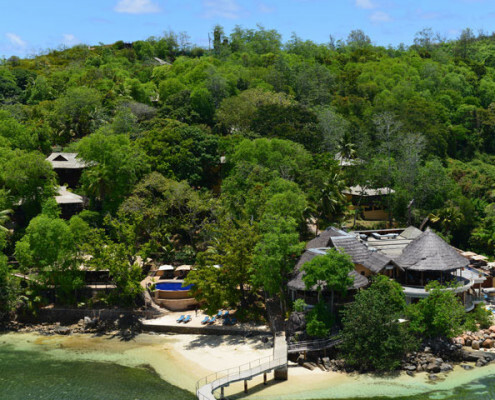 Just two minutes’ walk from the hotel lays the beach for those wishing to relax and savour the sounds and sights of the island. 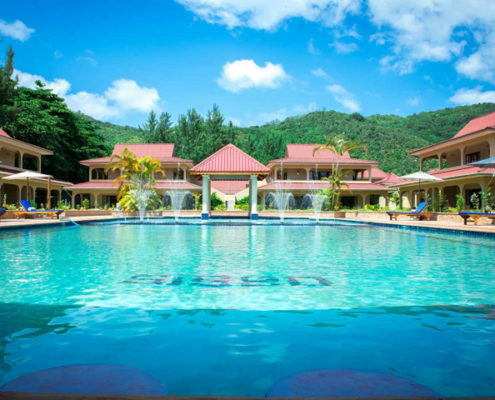 The Oasis Hotel, Restaurant and Spa is located is located a mere 5 minutes away from Praslin Airport. 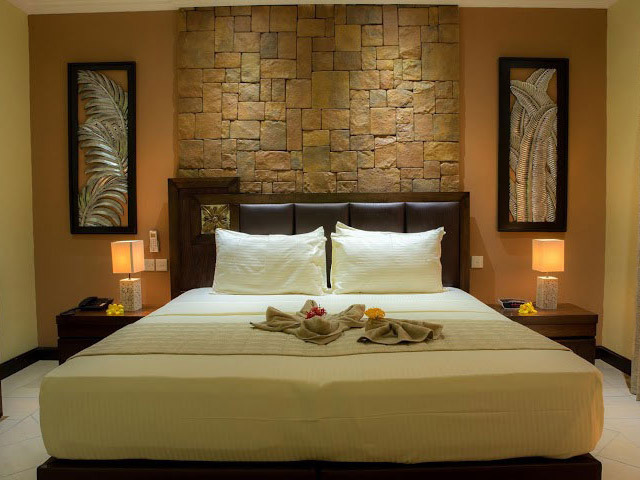 The Oasis Hotel, Restaurant and Spa offers a choice of Standard, Superior and Deluxe Rooms, both on Ground and First floor. The modern and smoke-free rooms are overly spacious with extra space and modern facilities to ensure a perfect stay for all our guests; from couples to families. The combination of traditional and contemporary styling is designed for total comfort and is complemented by chic furniture. The tastefully decorated Standard Rooms are ideal for a couple whilst the larger Superior Rooms are perfect for a couple with a child. Ideal for families, our Deluxe Rooms provide a spectacular view around our classic fountain pool and the beautifully landscaped gardens. 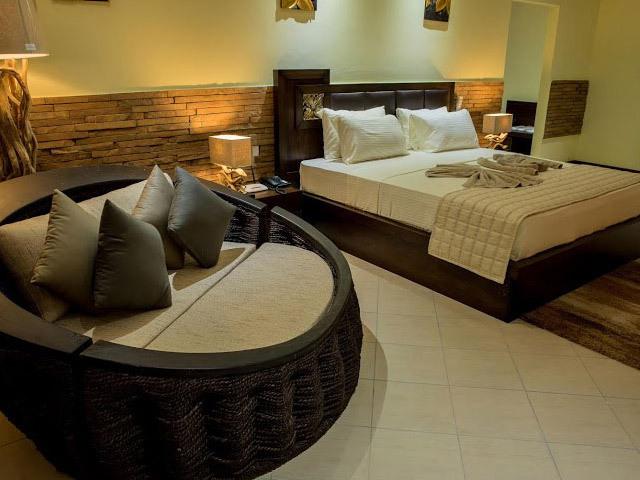 All rooms feature air-conditioning, ceiling fan, bathroom with bath tub, separate shower, double vanities, hairdryer, sitting area, free Wi-Fi, mini-bar, safe, Cable TV, telephone and tea and coffee making facilities. The intricately designed Rose Restaurant and Bar opens daily for Breakfast, Lunch and Dinner. An Exotic Buffet Breakfast offers an array of local and fresh produce from which to choose. A mouthwatering selection of freshly prepared à la carte dishes from the very best of local produce and seafood are offered at Lunch. Savour our culinary delights, relaxing by the pool or lounge. The Dinner menu features an exciting local Creole and International gastronomic experience with Themed Buffets offering a wide selection of hot and cold dishes to satisfy the most discerning of appetites. Relax with a lunchtime snack and a refreshing cool drink or tropical cocktail at the Fountain Pool Bar and Lounge with its chilled-out ambience. Once the sun has set this is another vibrant spot in which to hang out and have fun. The Fountain Pool Bar is open mid-morning till late. 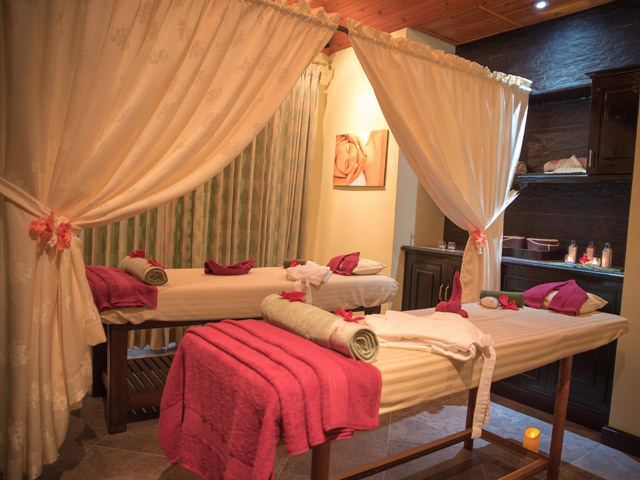 Indulge yourself with a Spa treatment designed to rejuvenate body and soul; radiate with beauty and healthy vitality from a choice of natural holistic therapies or sauna detox wraps. Pamper yourself from the range of traditional Thai massages in a calming and relaxing atmosphere. 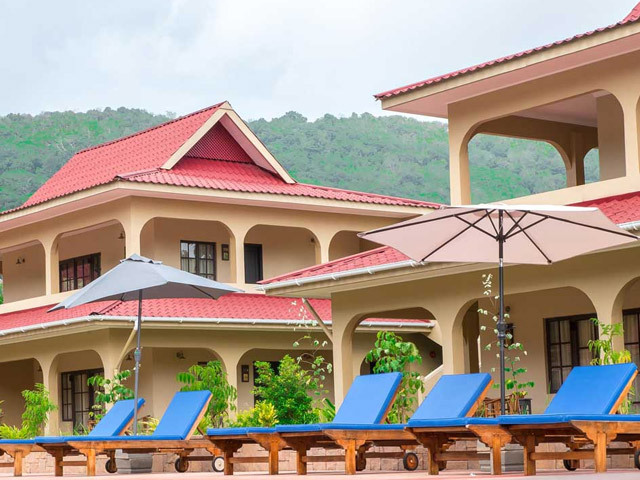 The Oasis Hotel, Restaurant and Spa also offers an activity/tour desk, on-site car rental service, laundry services, in-room childcare on request and free Wi-Fi in Lounge and Lobby.